NetSpades is a multiplayer card game which allows up to 32 people to take part as spectators or players in a four-handed game of Spades. That is to say: up to 4 people take a seat at the table and play cards, while the other 28 other people chat and kibbitz. Players may choose to expose their cards to individual spectators as they see fit. NOTE: Somewhere along the way, I lost the ability to compile this program, so there will be no new versions. Be sure it works on your PC before you even consider registering it. JUNE 2007: It is No Longer Possible to register this game. Please check out Arcadia synSpades instead. Spectators can peek at cards, if you allow it. Spectators can be gagged or ejected if they become unruly. Supports Rule variations, selected by Host. You may play the game solo, via modem, IPX LAN, or telnet. 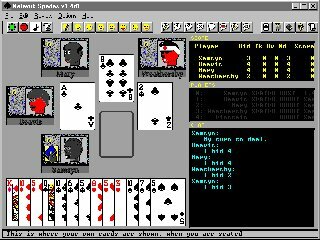 Download the shareware version of NetSpades 1.4 and get so addicted that you have to send me money!. But don't send money before you are addicted! I only want to get happy letters (or reports of genuine bugs, of course). Download the NetSpades Help File which includes full details about this wonderful experience. As I mentioned elsewhere, these windows help files are fairly huge, and it is probably a better investment of your time to download the whole thing, which includes this file. But if you are in a hurry, go for it! Here are a few random quotes from people who have registered NetSpades. Each game has its demographic, and the cool thing about the NetSpades demographic is that you folks send me xmas cards! I really appreciate that, thank you! Anyway, the award-winning game engine lives on in Arcadia SynSpades, which is free! NOTE: Due to operating system incompatibilities, I have lost the ability to make further changes to this program, so version 1.4 will be the final version of NetSpades. Be sure the game is working on your PC before registering it, as registration won't fix anything which might otherwise not have been working. Specifically I suspect the LAN "IPX" network play will get less reliable as computers evolve. So check out the multiplayer features before you register. I would actually make the game freeware now, but without the ability to compile a new version that is not possible. I apologize for any inconvenience this may cause you. Well, the help file has a more complete description of the game, and there are a lot of rule variations, but basically four people are dealt 13 cards each at start of play. Then, a round of 13 tricks is played where each player selects one card to play during that trick. The 'high card' takes the trick, with the exception that the trump suit (Spades) outranks any other suit. There are a bunch of rules for when you can play trump and when you have to follow the suit of the first card played. but the INTERESTING part is that just after getting your 13 cards dealt to you, you try to guestimate just how many of the 13 tricks you will take (this is then your bid). Your actual score depends on how accurately you guess this number (and how deftly you make that number come true in the cases where your guess was way off). You can play it partners mode, if you like, where people on opposite sides of the table try to help each other achieve their bids, without actually showing each other their cards. It's pretty cool. It's a lot less complicated than Bridge, which makes it more fun for me. It's one of those great games where you can start enjoying it right away with only a superficial understanding of what you're doing, and then get more and more into it as you start to understand the implications of various subtle...uh... things. Um, just give it a try, at the very least you'll enjoy making funny faces. Copyright 2013 (c) Synthetic Reality Co. All rights reserved.